HE PEOPLE OF Nineveh believed God's prophet and were ready to ask God to forgive their sins. They repented, and they were not destroyed. But the people of Israel did not believe the faithful prophets whom God sent to them, one after another. Some of them, of course, believed; but many of them did not. Their kings refused to worship God in the right way, and kept the golden calves, which the first king of Israel had made. Many years passed by, and God saw that the Israelites would never return to worship him as they had done in the days of David and Solomon. Nineteen kings had ruled in the land of Israel, and many times God had helped those kings out of trouble. Still they would not lead their people back to the true worship. At last God allowed an enemy to carry them all away to a strange land. Hoshea was king in Israel when the great Assyrian army came down into the land and took possession of it. 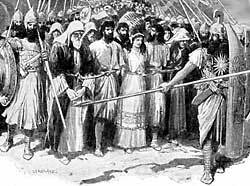 For a while Hoshea and his people paid a large sum of money each year to the Assyrian nation, and they were allowed to live in their own land. But when Hoshea refused to pay the money and sent to the king of Egypt for help, the king of Assyria sent his army again, and the army took Hoshea and all his people away from their homes and led them into heathen cities to keep them for slaves. This was the terrible punishment that their sins of idol-worship had brought upon them. And they were never again allowed to return to live in their homeland. The Assyrian king now ruled over all of the country where the ten tribes of Israel used to live. He wanted to have some people in that land, so he took some heathen people from cities in the east country and brought them to live in the cities of Samaria. He told them to work the fields and keep the vineyards, and pay him money from the crops they raised in Israel. The new people in Israel were idol-worshipers. They did not know about the true God at all. After they had been in the land for some time they became afraid of the God of that land, for lions would come out of the woods and kill some of them when they went out to their fields to work. They believed that the God of Israel was sending the lions among them because they did not know how to worship him. So they sent messengers back to Nineveh to tell the king about their troubles. They asked him to send a priest of the Israelite slaves back to Israel, that he might teach them to worship the Israelites' God. The king sent a priests of the Israelites, and he went to live in Bethel. He told the strange people about the true God, and they, too, tried to worship him. But they continued to worship their own gods, and their religion became a mixture of right and wrong. Even today some of the descendants of those people are living in Samaria, and their worship is a mixture of idolatry and the religion of the Jews.